This season, we've decided to ask three of our favorite stylists to pick outfits from our kids’ collection and to dress their own children for a very special and personal editorial. This time, we are happy to introduce Mafer Navas. The stylist has worked with publications that include MilK and Vogue and focuses on fashion, kids fashion & advertising. She was born in Colombia, grew up in Mexico City and Madrid and has been based in Barcelona for the past 16 years. 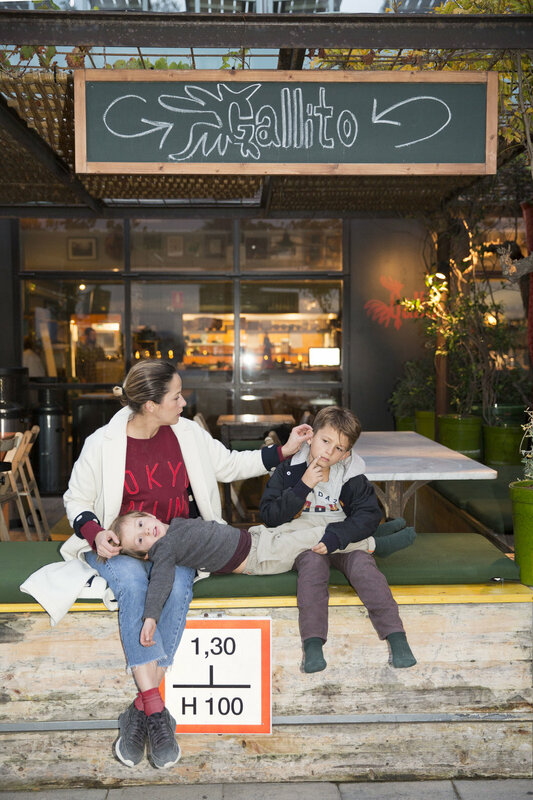 Her exclusive editorial for Bellerose features her children Leo and Enzo and she told us how much fun she had picking her favorite pieces from our Fall/Winter 2017 collection in the interview below! Can you tell us a little bit about you? Where are you from, what do you do? I was born in Cartagena de Indias, Colombia, raised in Mexico City & later Madrid, and finally moved back to Colombia for my teenage years. I have been living in Barcelona for 16 years now, so I am also a bit of a Barcelona girl. I think of myself as a mix of all these cultures. People say that, as a good Aries, I am extroverted, funny, creative and hard working. I am a stylist, and I work in fashion, kids fashion & advertising. I am a child at heart myself, so I feel very comfortable around kids! I have a young spirit and love working with them. It is fun, but can also be extremely tiring. What is the shoot, editorial or project you’ve loved working on the most? I try to give everything I can with every project; I like getting involved not only in the styling, also in the art direction & concepts of the stories. I like many of my editorials, they let me express my artistic side, and I can experiment much more than in commercial jobs. My favorite at the moment are two editorials we shot in Colombia for MilK & The New Story, because I we went to remote places and worked with local children that where not models. Every project is different, sometimes I start with a trend, other times with a color palette, or sometimes I draw inspiration from a specific decade… Inspiration is everywhere! For example, one day I went to wash my car with my husband and kids, and as I sat inside the car I saw clearly an editorial, which I later created for Vogue.es, titled “Car Wash”. When it comes to your kids, what is important for you when you dress them in the morning or go shopping with/for them. Oh my kids… I wish they would let me do a bit more of experimenting… The older one is focused in being comfortable so all his clothes have to be very light and flexible. Getting a nice pair of trousers on him is a big discussion. That's why I try to buy things he would like but in my style. The little one is 4 years old and he is very determined, so he chooses his own clothes… I am left aside in the decision making. Still every now and then I can push for a more edgy kids' look. Checkered and velvet! I Love a full checkered & tartan look. What is your impression on the Bellerose Kids collection for FW 2017? I am a big fan of Bellerose, and love the way you mix a classic style with a twist, with amazing fabrics and very good quality! I think the kids' collection is fantastic, well thought for them: comfortable & stylish. You have more fun garments that can be mixed and matched with more usual pieces. You can go for a total fashionable look or for a more down to earth one. But always classy. For Leo I chose a cool T-shirt with a “Hero” print, because he is now learning about letters, and I thought we would love being the HERO of the day, every time he wore it. Then I chose a very cool and simple grey jumper to pair with camel trousers, classy and stylish at the same time. For Enzo I chose a 1989 T-shirt, thinking of the Stranger things inspiration going around, matched it with a cool hooded bomber jacket (he loves hoodies!) and easy checkered burgundy trousers, which he loved because they are super comfortable and he thought he looked very cool in them. 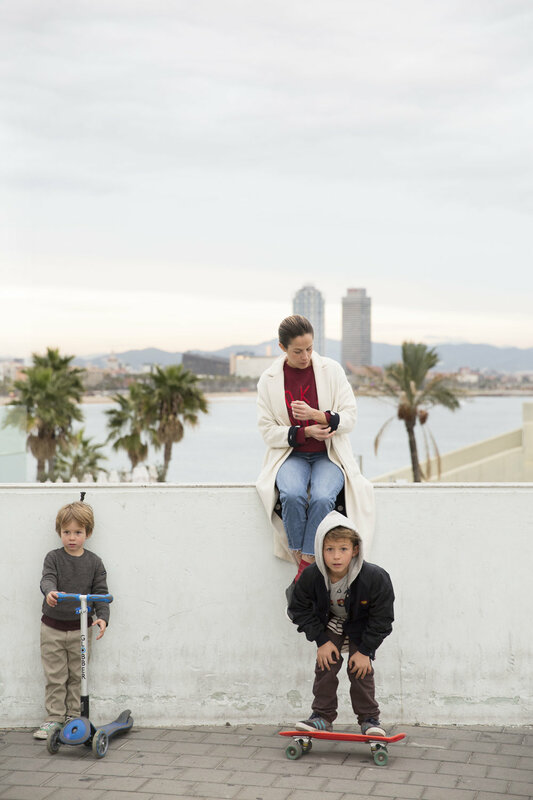 And last but not least, where are your favorite places to spend time with your kids in Barcelona? We love hanging around the beach front in Barcelona. We like going to Gallito restaurant. because the adults can have a nice drink & food, it is easy, relaxed & stylish plus the kids can run around the beach. We also love hanging around the park Ciudadella, and later having a snack at Super coffee store. Another very cool place we love for kids is Deu Dits, were they can do indoor climbing.